Confession: I am an introvert, as I imagine the majority of writers must be. This makes the tasks of self-promoting, public speaking, and the ever-dreaded networking nearly insurmountable for me. While an extrovert views a room full of strangers as a room full of potential friends, I use the spy skills I’ve acquired from watching Alias and all the Jason Bourne movies to scope out all the escape routes. Alas, I am not as agile and quick to escape as Sydney and Jason; thus, I usually find myself stuck in awkward small-talk. I despise small-talk. It’s so…small… and insignificant. I only want to exchange verbal words that have meaning. And don’t get me started on having to talk about myself to strangers. All of this is to express to my readers the fear and anxiety I felt going into the huge book signing and author event I was part of on Saturday. There were around fifty authors and random people coming into the Veterans Memorial Library in St. Cloud, Florida that day. I felt like part of an assembly line, or worse, part of a speed-dating event. 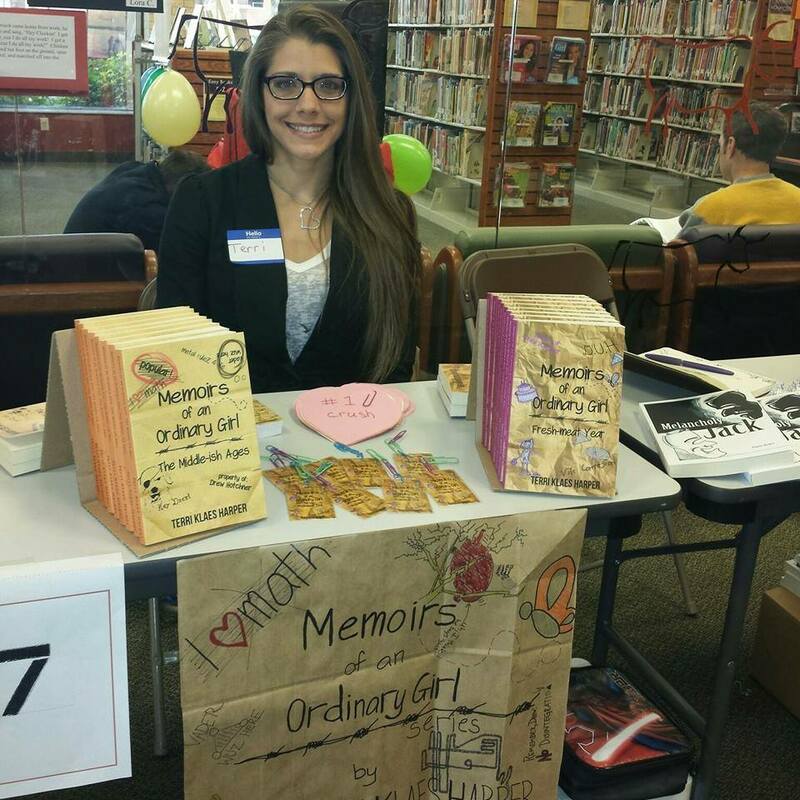 Authors were lined up at tables with our books, business cards, and shining smiles on display. Potential readers journeyed from table to table, judging our books by their covers, occasionally asking us questions about ourselves and our books. Whenever I had the chance to talk, I felt like I was vomiting incoherent strings of words. Yet, I felt a value in all of the torture. It was a chance to be seen, to tell about Drew, my dear protagonist/me, and to see what other authors do. We all had a chance to learn from each other, spanning across the genres. Yes, this was a valuable experience, even if it made me feel as out of place as an adult at a Justin Bieber concert. I also just gained access to my interview from the event. Posted in Author, Humor, Reflection, Uncategorized and tagged author, author interview, book signing, indie author, introvert, networking, Saint Cloud Author Symposium. Bookmark the permalink. I’m an introvert myself but I can fake being an extrovert pretty well. Although every once in awhile the anxiety of large groups wins out. I to hate small talk ! I loathe it! But it seems a necessity in order not to appear totally socially inept. I have this “secret” rule. I don’t want to be approached unless you have something interesting, useful or funny to say. That sounds rude but I hate to have my little fantasies in my head interrupted over an obvious weather observation. Haha! If only people knew that we were fantasizing, writing our next scene, our next blog, or poem, then maybe they would understand that whatever small talk they want to share with us is insignificant in comparison! All I ask is that you not bore me. Oh, and don’t make jokes about my height. I’m not a miniature person. A teacup human. I’m just short. And I’ve already heard your jokes a thousand times. They’re not original.